You are here: Home » Columnists » SSA: Say What? Table VI.A1 in Appendix A of the 2013 Social Security Trustees Report shows $2,609.7 billions for the amount of Asset Reserves at the end of 2012. In response to a flood of questions from concerned beneficiaries, the Social Security Administration, in consultation with the Treasury Department, has begun advising people that it cannot guarantee payments after Oct. 17 unless and until Congress acts. 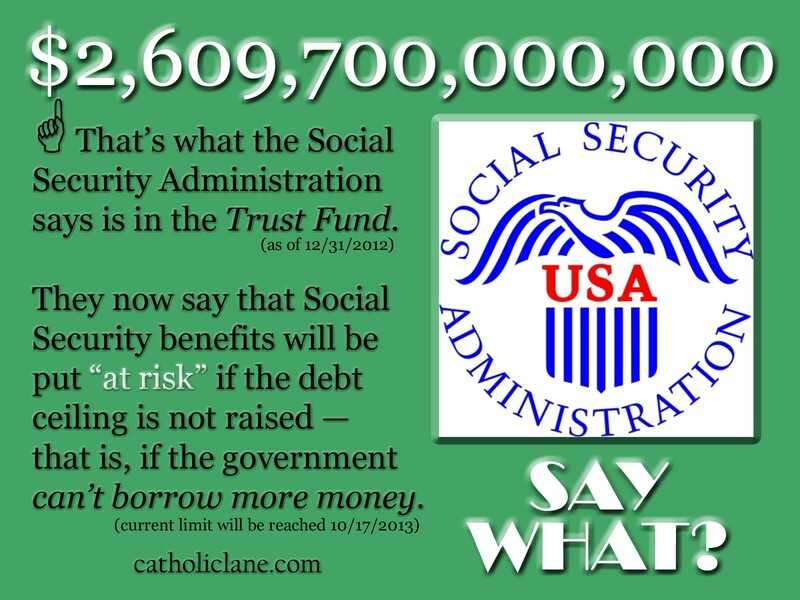 “Unlike a federal shutdown which has no impact on the payment of Social Security benefits, failure to raise the debt ceiling puts Social Security benefits at risk,” a Social Security spokesman told ABC News. One wonders why that spokesman couldn’t be named.